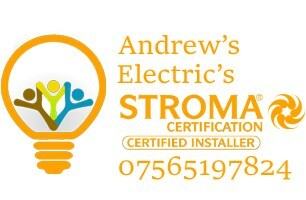 Andrew's Electrics - Electrician based in Buriton, Hampshire. Welcome to Andrews Electrics We are a family run business and offer a full range of services that includes domestic and commercial we are a friendly, reliable and professional service no matter how big or small. We are full scope STROMA & Part P certified so you can be sure that all work carried out by us is to the highest quality and standards. From residents, landlords and business owners to building contractors we have over 10 years experience in the industry ? Here is a short list of some of our most commonly requested tasks which we competently carry out on a regular basis. * Replacing Switches and Sockets. * Residential and commercial Certificates. * Rewires - full and part. * Lighting design and control. * Garden electrics and lighting. * Heating wiring - Nest & Hive.